Recent Arrival! 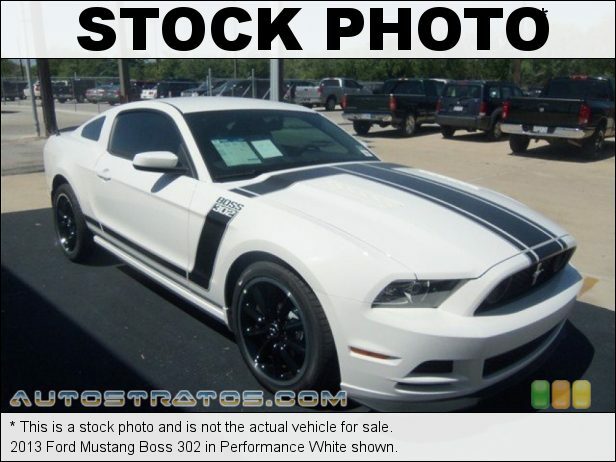 2013 Ford Mustang Boss 302 Performance White ** BOUGHT, SERVICED AND TRADED AT MOON TOWNSHIP FORD **, ** CLEAN VEHICLE HISTORY...NO ACCIDENTS **, ** RECENT TRADE IN **, ** SERVICE RECORDS AVAILABLE **, **INCLUDES WARRANTY**, ** NON-SMOKER **, ** ONE OWNER **, ** LOW MILEAGE **, 19"x9" Fr / 19"x9.5" Rr Painted Aluminum Wheels, Boss 302 Floor Mats, Boss 302 Weathershield Car Cover, Boss Package, Brake assist, CD player, Cloth RECARO Sport Seats, Delay-off headlights, Dual front side impact airbags, Electronic Stability Control, Equipment Group 500A, Front anti-roll bar, Front wheel independent suspension, Fully automatic headlights, High-Intensity Discharge Headlights, Illuminated entry, MP3 decoder, Occupant sensing airbag, Outside temperature display, Panic alarm, Premium AM/FM Stereo w/Single CD/Clock, Radio data system, Rear anti-roll bar, Remote keyless entry, Speed-sensing steering, Steering wheel mounted audio controls, Tilt steering wheel. 15/26 City/Highway MPG Awards: * Car and Driver 10 Best Cars * 2013 KBB.com 5-Year Cost to Own Awards * 2013 KBB.com Brand Image Awards Car and Driver, January 2017. Reviews: * Whether you want to relive your youth or are just looking for an affordable and livable sports car, the Mustang can grant your wish. Power-mongers who seek bragging rights to the world's most powerful production V8 engine can pony up to the Shelby GT500. Source: KBB.com * Strong V6 and V8 engines; capable handling; useful Ford Sync electronics; lots of performance customization possibilities. Source: Edmunds Proudly serving: Moon Township, Pittsburgh, Monroeville, Wheeling, Penn Hills, Carnegie, Cranberry Township, North Huntington, Butler County, Allegheny County, and all of greater Pennsylvania, West Virginia, Ohio, and Maryland.